My backyard aviary in San Diego, California is positioned near a lush water garden accentuated by a waterfall and Koi fish. It is a galvanized, rust proof wrought-iron construction with black non-toxic powder coating and a solid metal roof. Eight panels form an octagonal shape (6x8 feet high) with ½ inch metal grating. Attached is a 2½ x 3 x 6 foot catch. Flagstone flooring was extended to match the existing patio and sloped slightly toward the 5 inch covered drain slightly off center inside the structure. During the colder weather, plexi-glass sheets are attached by bolts and wing nuts to the three front panels for clear viewing of the interior of the aviary. The panels are placed right against the wire so that no water can drip down off the roof and run down the inside of the plexi-glass. During the late winter and spring, I have taken the front three plexi-glass panels on and off to correspond with the weather and found them quite cumbersome. I am looking into whether or not the polycarbonate sheets are available in clear plastic to replace the plexi-glass panels. Polycarbonate sheets cover the remaining five panels. The polygal thermoplastic polycarbonate sheets are ultra-light weight, energy efficient, flame-retardant, weather resistant and have excellent light transmission. The panels can be cut, sawed, drilled, nailed or screwed into place without splitting or cracking. 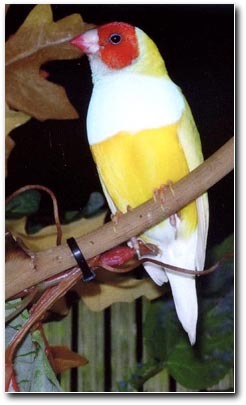 The ones I have are opaque, so I use them around the back and side of the aviary. This makes the birds feel very safe. The sheets have an air chamber similar to a dual-pane window to help insulate. The sheetings are very easy to put on or take off the aviary. Heating elements include two thermo�perches and four ceramic infrared heat emitters (two 100 watt and two 150 watt) in 8 and 12 inch porcelain clamp light fixtures. These fixtures are installed close to the ceiling and face toward a central area. A full spectrum 17 inch bulb and a 25 watt porcelain covered blue bulb are located on the center roof crossbar. The blue "night light" comes on at dusk and 30 minutes after the full-spectrum light turns off. It provides a soft glow that helps with night- fright. 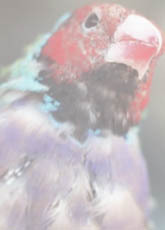 During cloudy or winter days, I have observed that the birds seem brighter when the full-spectrum light is illuminated. However, throughout the summer months, the aviary receives enough sunshine to warrant leaving it off. All of the electrical is run to a central fuse housing with separate timers. In my opinion, aesthetics are important to form and function. Silk leaves of various types cascade over nest boxes and along dried grapevines, which are strung from side to side and hang vertically in a spiral. Autumn colored leaves seemed suitable for this fall, and the Cordon Bleus have built their nests in these. I plan to economically replace the leaves to correspond with the appropriate season. Hopefully, I can clean and store them to reuse or discard if necessary. 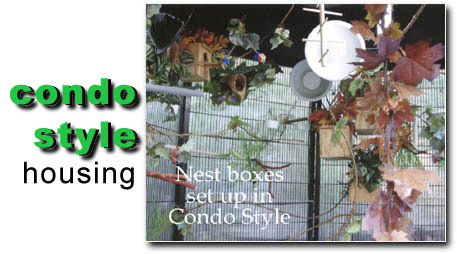 As far as "aviary furniture", there are three Gouldian nest boxes positioned in condo style (one placed under the other in a staggered order), assorted wicker nests and a plywood nest box. Besides the thermo-perches, there is a sandy perch and a sandy perch swing, a large wood multi-perch, and Manzanita branches. Along with the grapevines (some vertical and slightly coiled), I think that there is plenty of "perching power"! Silk leaves hang from a suspended decorative birdbath. Two live Juniper trees in black pots are positioned next to the panels. Black pebbles cover the soil so that the birds do not ingest any fertilizer or fouled soil. At this point, I am still experimenting with feeding stations. I purchased a tripod birdfeeder with a green plastic round tray on top and a smaller matching tray that fits under the tripod and within its legs. 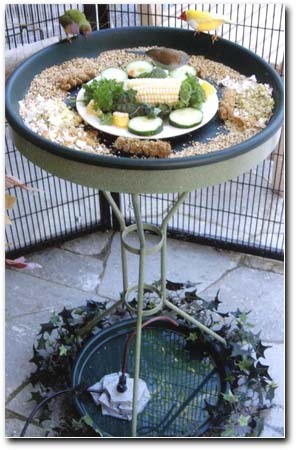 The top tray is used for seed, egg foods, soaked millet and the " deli-dish" (fresh organic green leafy vegetables, fruit, corn on the cob, cucumber, broccoli and grated carrots). In addition, two cuttlebone, three mineral blocks and two hanging water bottles with springs and rubber glass stoppers are mounted on opposite ends. Serving dishes for charcoal, oyster shell, herbs and F-Vite and two hanging seed troughs are hung for those birds that like to remain elevated. Millet seed is suspended from the grape vines in two areas. Also, a container of organic wheat grass is wedged in among the vines. The lower tray sits on the flagstone flooring and under the legs of the tripod. Water is pumped into this tray by a cane-shaped spigot with a water line that is on a battery-operated timer at various times and for various lengths of time. The water stays clean because the upper tray is much larger. Consequently, the food and droppings from above do not contaminate it. When the water overfills the tray, it just goes into the drain on the flagstone flooring. I have observed that the birds enjoy the running water at various time increments. I think it helps with the humidity level during the dryer summer months and , as it is not their main water source, I remove it altogether when the weather is wet and cold. Since, as I mentioned before, the aviary is located near a water garden, it is important to keep the floor as dry as possible during the winter. Both the birdbath and the battery operated spigot were purchased from the Wild Bird Store. 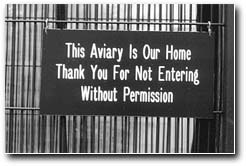 The aviary was finished in July 2004. 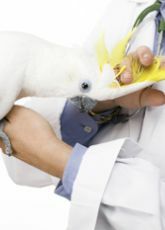 I am definitely an amateur bird keeper and seem to be in the trial and error mode most of the time. As they say, "Bird Keeping is not for the faint of heart". However, continued research and my curious nature resulted in a suitable habitat for my small band of winged friends. 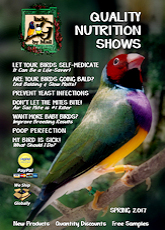 The information and products I obtained from Laraine at ladygouldian finch.com and Karl of Birdcrazy in San Diego are invaluable. 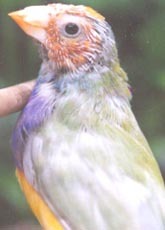 At present, the inhabitants are five Lady Gouldian Finches, two pair of Cordon Bleus and one pair of Owl Finches. 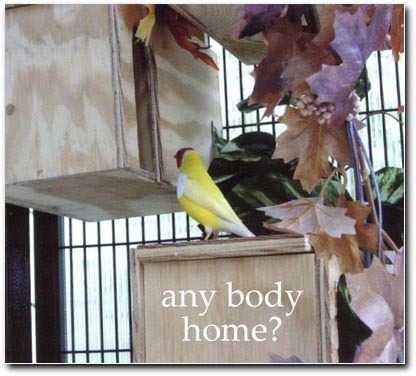 There are three newly acquired Lady Gouldian hens in quarantine. I hope to add a pair of Gloster Canaries in the future. 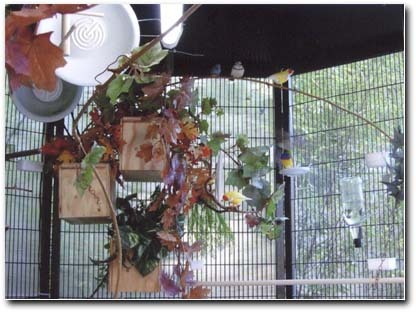 Guy of GS Dreamscaping in San Diego performed the assembly of the aviary, electrical work, and plumbing, flooring plexi-glass and polycarbonate installation. His talent, professionalism and patience are very much appreciated. My goal is to have these fascinating beautiful creatures thrive in a happy, healthy and comfortable environment. They bring much joy to my life and I love them.